Budget Air Supply was a simple idea back in 2008 when the owner of the company was looking to repair his 8yr old air conditioner at his home in Davenport, Florida. He called a seven different A/C repair companies to come out to give an estimate on the repair of his unit. Out of the seven, only two called back. He scheduled both to come out to give an estimate but, only one company showed up for the appointment. The one that showed up said the 8yr old system was not worth repairing and that he needed a whole new a/c system. The estimated cost of the new system was nearly half of his annual salary and he refused to go ahead with the replacement. A week later, his system was repaired by a friend who just replaced a simple capacitor - which cost him $120.00. Out of this grueling process of bad service, people failing to show up to appointments and potentially overcharging for the replacement of the a/c unit, he figured there was a big need in the market for honest, quality customer service and low cost air conditioners for homeowners and local contractors. If he could find a way to give homeowners, property managers, contractors and schools air conditioners and repairs without breaking their wallet, he could make a decent living out of it for him and his family. That is when Budget Air Supply was conceived. 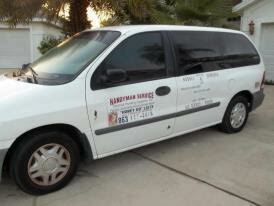 In 2009, he put some vinyl letters on a minivan and started servicing the local area, offering "handyman" services. He offered free service calls and low cost repairs to homeowners and property managers in the local area. The business was good and he was able to build a client base of many happy customers and a few property managers that needed constant care of their homes and A/C units. In 2010, The Company became licensed by the State of Florida for HVAC Service. Still having the plan to help homeowners with an affordable solution for air conditioners, repair, service, parts and supplies - Budget Air Supply was finally Born. They figured the best way to have success would be to open an office in Davenport and provide quality service, repair, parts and installation of the equipment. This proved to be difficult because many of the supply houses were 30 miles away or more which added an additional cost to the homeowner. That's when Budget Air Supply decided to open a warehouse so not only will have the parts on hand, but also distribute the parts to local contractors, homeowners and property managers who needed them fast and at affordable prices. In 2011, we decided to explore additional ways the expose our amazing prices to more people and Budget Air Supply decided to enter the online marketplace with BudgetAirSupply.com. This allowed us to post prices of equipment and offer them to homeowners, contractors and property mangers at below "Manufacturers Pricing" and install them directly through their own service technicians... AND THAT IS WHEN IT HAPPENED! We also believe in giving back to the community - we are big proponents of charity and feeding the hungry children in our area. We also donate to food banks of Central Florida on a regular basis. We donate our time, working in soup kitchens during the holiday season, package and wrap "Toys For Tots". Budget Air Supply also support cerebral palsy foundations, charities that help children with disabilities and Breathe Easy for Children with Cystic Fibrosis. We have given free air conditioners to many people in need and many other charities. We are strong supporters of our troops and believe wholeheartedly that our Veterans and wounded warriors need our help for their contributions in keeping us all safe. A portion of every sale goes to Paralyzed Veterans Association. At Budget Air Supply we believe in one philosophy... "Pay it forward or you will always fall behind"